Ok, not as 'how-to' as I'd like, but a good example of removing the shroud of mystery from vertical greening. 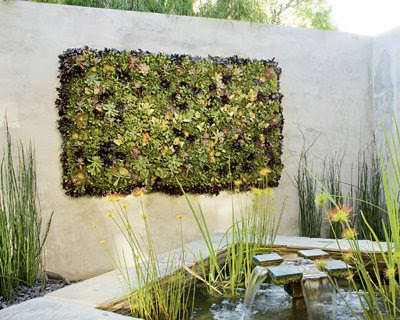 From Metropolitan Home, via Dwell, a project that "...shows how one couple planted a vertical patch (above) of echeverias, aeoniums, sedums, and kalanchoes." More from Metropolitan Home: "First, they sketched out an impressionistic plan of how they wanted their piece to look. 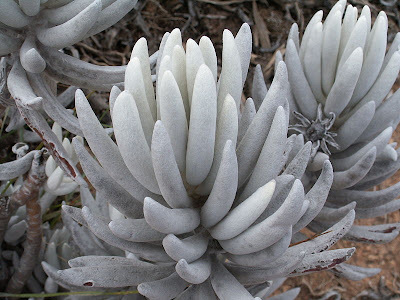 Next, they canvassed nurseries for flowerlike echeverias and aeoniums, plump sedums and crassulas, finger-shaped senecios and fuzzy kalanchoes. These small gems run the gamut of hues, from soft silvers to pink-flushed golds and greens to shiny reds and near-blacks. ...To set them off, the designers devised a three-by-five-foot steel armature fitted with two layers of metal mesh to create a wide, shallow box. They laid their box on the ground and had it stuffed with a blend of sphagnum moss and cactus mix and planted with hundreds of cuttings, arranged to balance forms and hues within a frame of black Aeonium 'Zwartkopf.' Some 45 days later, once the plants took root, the piece was ready to mount, with eyebolts and heavy brackets." While the use of sedums and other crassulas such as sempervivum are typical of ecoroof and vertical gardens, there are definitely some additional species worth a closer look in this project. 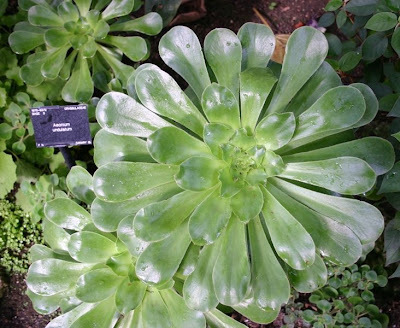 Aeoniums are a variety of succulant that are indigenous to the Canary Island region. 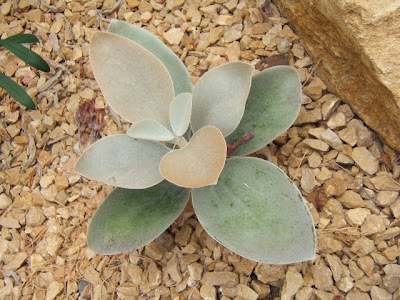 Kalanchoes are definitely interesting, with a fuzzy and an interesting growth pattern. Via Wikipedia: "Members of Kalanchoe genus are characterized by opening their flowers by growing new cells on the inner surface of the petals to force them outwards, and on the outside of the petals to close them." It's an interesting idea and an inventive combination of plants. Plus, the idea of flat-grown - then vertically mounted planting makes a lot of sense, and is actually the recommended process in a number of systems. In contrast, Patrick Blanc's walls are in situ - which to me is a much more difficult proposition. It's interesting to see how the natural phototropism of plants reacts in vertical conditions - causing them to grow both out and up (towards the light...). It's definitely a horticultural puzzle to see what works in these specific conditions, and these are some interesting additions - all not without issue. Via Metropolitan Home, some of this experimentation with the less well-behaved plantings: "Certain aeoniums, for example, have shot up far beyond the five-inch height that's optimal for a uniform, painterly look. So these--roughly ten percent of the composition--must be cut back periodically and the small cuttings reinserted in the mesh. Many plants also bloom, producing stalks and sprays that require snipping." Very impressive. I wish I have more space in our backyard so I can try one. Truly a master piece.